This is my very first quiltwork. I made a very simple one for a start. Tämä on ihan eka tilkkutyöni. Tein ensi alkuun hyvin yksinkertaisen mallin. I started on once, never finished it. I is not the easiest thing to sew something so small. So, Well done! Your quilt is so beautiful. Well done!! That is so sweet. I love the prints! 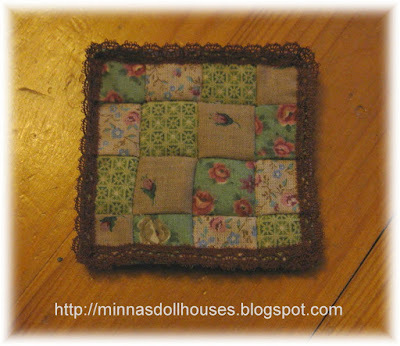 I know it's not easy to sew/quilt something so small! The smaller, the more difficult! You did a very nice job, it's very cute.